It is so easy to grab fast food when I’m on the go constantly, but I feel pretty awful physically if I rely on fast food to fill in the gaps on those busy days and nights. I feel far healthier when I remember to have some great, ready-fast options on hand. My current favourite is to make Big Batch Greek Lemon Garlic Chicken. 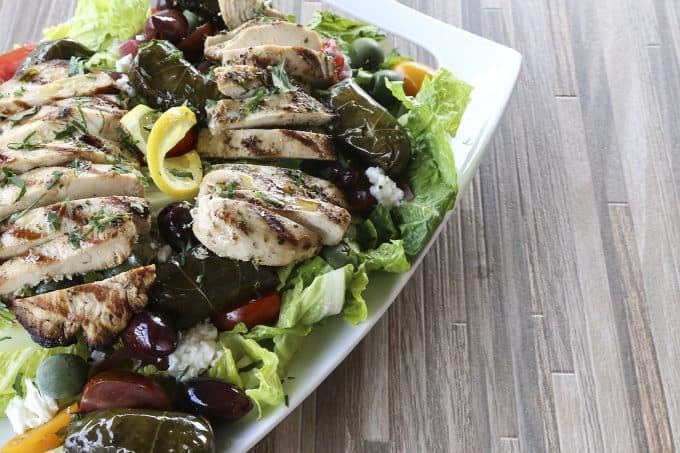 Tender, tangy, fragrant and flavourful, and as easy on the wallet as it is on your clock, Greek Lemon Garlic Chicken is the answer to life on the fly. There are only 7 ingredients in Greek Lemon Garlic Chicken -lemon juice, red wine vinegar, olive oil, oregano, salt, pepper, and chicken- but each one packs serious punch in the flavour department yielding a tender, juicy, lemon and garlic herb chicken that is perfect for serving along just about any side dish, on a roll with Sun Dried Tomato Spread, or sliced into strips and served on dinner salads. You can even stir this into a soup like this Greek Lemon Chicken Soup, making it an even faster soup! The trick to cooking chicken breast on the grill without drying it out is having an evenly thick piece of meat. Chickens don’t grow evenly thick breasts, though, so we need to help the process out a little bit. This can be done one of two ways. You can smash them (which always seems a little time consuming and messy) or you can use my favourite method: hold a large, sharp knife parallel to the cutting board and cut the down the length of the chicken breast, dividing it into two evenly thick pieces. This is easiest if you press your other hand down flat on the chicken breast to hold it steady. You can see me doing this in the video on this post. People. Friends. Loved ones. Don’t skimp on the garlic here. It MAKES the dish. You can increase the garlic if you want, and I often do, provided I don’t have to go teach a barre class and breathe in someone’s face immediately after eating. The garlic is everything here. Truth? I prefer to use fresh lemon in this dish because it seems brighter, but I have used bottled lemon juice and loved the results, too. Do what you want/need to do to get this chicken on your table. You’ll be so happy. More truth? This chicken is plenty marinated after an hour thanks to the high acidity of our marinade. You can go as high as 4 hours, but you probably don’t want to go longer than that. Why? Acidity can actually start chemically changing the structure of meat. The result will be that your meat may have a mealy texture after cooking. It’s not inedible, it’s just not as good and juicy as it would be with the shorter time in the marinade. I love having this chicken leftover in the refrigerator, but you have to use it up within 3 to 4 days. At our house, that’s no problem at all since we are feeding a small regiment. To store it longer, chill the chicken thoroughly in the refrigerator. Wrap each piece of chicken tightly in plastic wrap, then tuck the wrapped pieces into a resealable zipper top bag and stash in the freezer for up to 3 months. 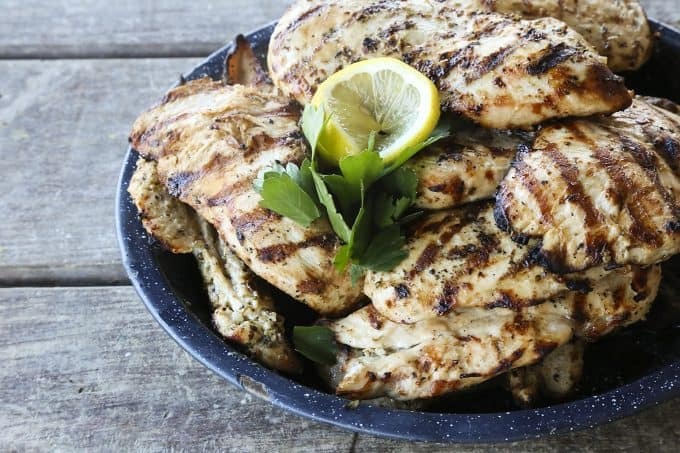 Flavourful, fragrant, juicy, grilled Greek Lemon Garlic Chicken is made in a big batch for eating right away and for quick meals later. Add all of the marinade ingredients to a gallon, zipper top freezer bag. Close the bag and squish to combine the ingredients. Open the bag, fold back the top a couple of inches and add the chicken breasts or thighs. Close the bag fully and shake and squish to evenly distribute the marinade amongst the pieces of chicken. Open the corner of the bag and squeeze out as much air as possible then reseal. Place the bag in a square or rectangular pan and refrigerate for at least an hour but up to four hours. If you can, flip the bag once, halfway through marinating time. Preheat a gas grill to high heat. Use tongs to take one piece of chicken at a time and lay it onto the grill. Do not move the chicken once it is in contact with the grill. After 2 minutes, use clean tongs to rotate the chicken 90 degrees. This will give your chicken lovely grill marks. After another 1 1/2 minutes, flip the chicken over and cook for 1 minute. Rotate the second side 90 degrees for the cross-hatch grill marks, grill for 1 more minute, then transfer to a rimmed plate. You can serve the chicken immediately, refrigerate and use within 3 days, or freeze the cooked chicken on a sheet pan. When they are solid, wrap each breast individually in plastic wrap and transfer to a zipper top bag. For best texture and taste, use within 3 months. Sounds delicious! Gonns try it very soon. But where does the lemon juice come in? It’s not listed as an ingredient in the marinade and its use is not mentioned in the directions. I would guess that the juice is part of the marinade and that the reipe formating is incorrect. Right?…. This looks great! I’m assuming the lemon juice goes in the marinade as well . . . Correct! Not sure what happened with the formatting there! 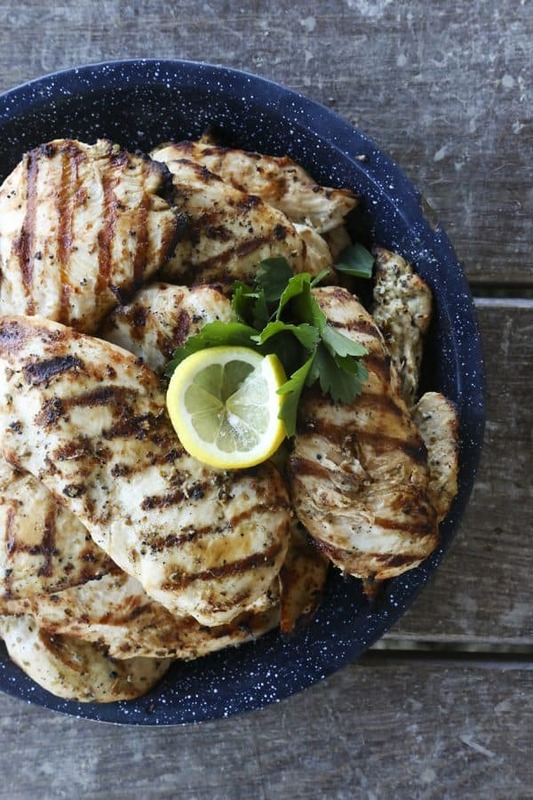 Love me some grilled chicken breasts. Will be sure to try these out. Holy WOW! Made it tonite—freaking fabulous… I feel like i could actually use the marinade as a salad dressing in the future—it is so good. I used Meyer Lemons and I grilled some long sliced zucchini first, topped them with some feta crumbles and then topped all that with slices of this glorious marinated grilled chicken! Peeps! YOU HAVE TO TRY THIS CHICKEN! Just DO IT! Thanks, Julie! I’m so glad you liked it as much as we did! I agree that the marinade would make a great salad dressing! 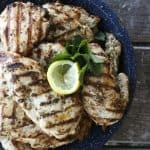 Happy to find your site today I love chicken with lemon and garlic and want to try this but I do not grill. Can you give instructions to cook differently? Last time I tried pan frying thinly sliced chicken, one piece was awfully rubbery but the rest was edible. Overcooked but hard to get temp on thin cut and didn’t see any juices to tell if clear/done. I want to make a company worthy dish. Thanks. I am having a dinner party soon and one guest has multiple allergies. This recipe will serve him well, thanks! Any sides you recommend that are free of: dairy of any kind, leafy of any kind, nuts of any kind, and onions? I’m so glad you like this one, Ann! That’s quite a list of limitations for your guest. How about Hummus?